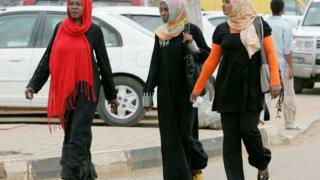 Charges of indecency have been dropped against 24 women who were caught wearing trousers at a party near the Sudanese capital, Khartoum. The gathering was raided by morality police on Wednesday. If convicted, the women could have faced punishment of 40 lashes and a fine for wearing "an obscene outfit". Rights activists say tens of thousands of women are arrested and flogged for indecency every year, and laws can be applied arbitrarily. They say the law in Muslim-majority Sudan against wearing trousers and short or tight skirts discriminates against Christians. Traditionally, women in Sudan wear loose flowing robes. Campaigner Amira Osman told Netherlands-based Radio Dabanga the public order act violated women's rights. "The party took place in a closed hall in a building in El Mamoura [south of Khartoum]," she said. The law - Article 152 of the Criminal Code - applies to "indecent acts" in public, wearing an "obscene outfit" or "causing an annoyance to public feelings". Video Should women in Pakistan be told what to wear?